We had a brief history lesson of the surveying of India and Peak 15, later known as Everest; the politics of British relations with Nepal and Tibet in gaining access to the mountain. A description of the geology of the mountain and how this affected the routes chosen by the the early climbers. The photographs of the expeditions were largely from the collection held by the Alpine Cub. 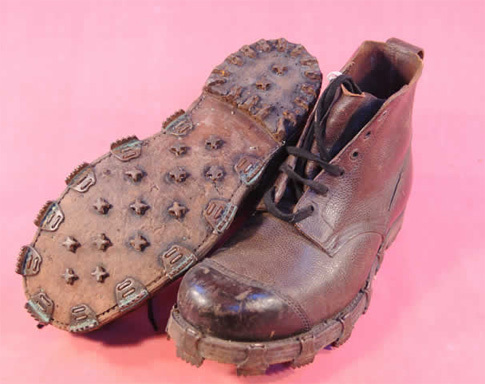 The Everest doctor on the 1933 expedition was Dr Greene and his tricouni nailed leather climbing boot and long wooden ice axe were on show, on loan from the Alpine Club. Andrew Elliott donated three books which Hywel auctioned. The final amount raised was £400, £280 to Church funds and £120 to the Bell fund to repair Number 2 Bell pulley and ropes damaged by a squirrel last year. Many thanks for all your support to help make a successful and enjoyable evening. This entry was posted on Tuesday, November 26th, 2013 at 8:45 am	and is filed under News. You can follow any responses to this entry through the RSS 2.0 feed. You can leave a response, or trackback from your own site.